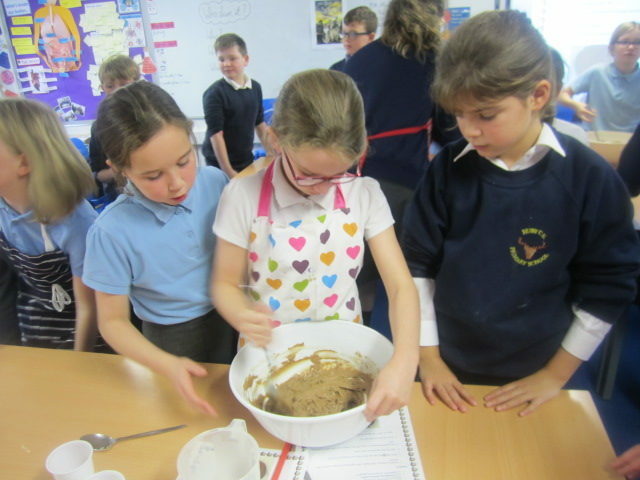 Taught by Mrs Borwell with Teaching Assistant Mrs Webster. P.E. – We do P.E. on a Monday and Thursday. Please make sure that children have both indoor and outdoor PE kit as we will try our best to learn PE outside as much as the weather allows. SMIRFS – We will be testing SMIRF targets each Friday morning. 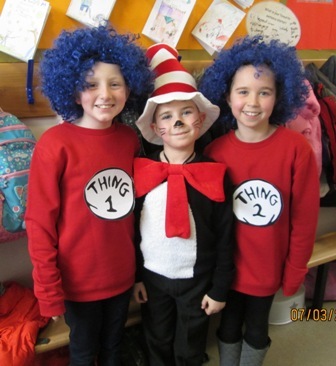 Notices – All reading books and reading records to be in school every day. 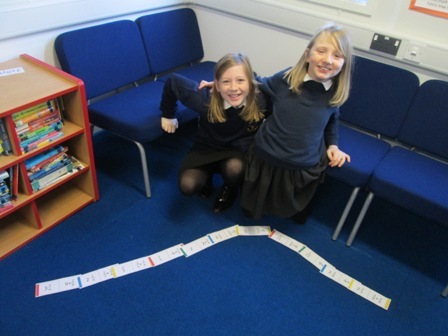 We are having a real push on reading in Class 4 so Mrs Borwell and Mrs Webster are checking the reading records on a very regular basis. Hello, welcome to Class 4’s page. Below you will see what we have been up to throughout the Spring term so far. As you can see we have been very busy but we are having lots of fun learning new things every day. 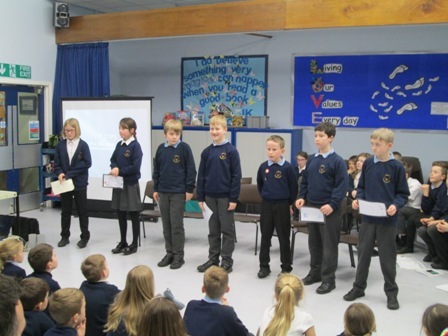 This term the Year 5’s will be working with Mrs Booth to gain their Young Leaders award. 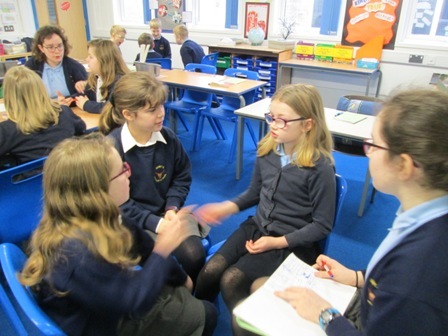 This is a great opportunity for the Year 5’s to demonstrate their kind, caring personalities. 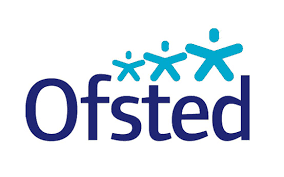 Whilst the Year 5’s will be working towards their award, Year 6’s will be focusing on Year 6 objectives and gaining confidence in their own abilities with me (Mrs Borwell)..
What’s going on in Class 4? 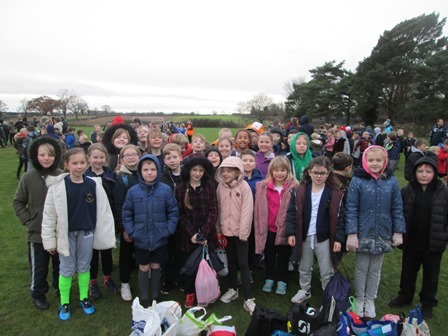 The Year 5’s have had a fantastic time at Carlton this week. 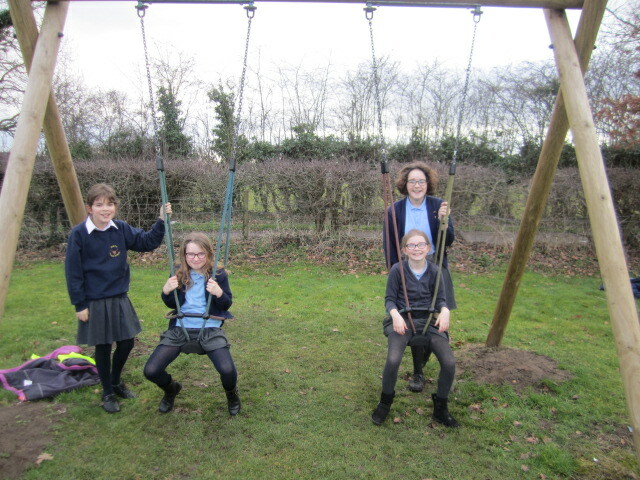 They took part in lots of exciting activities including raft building and the high wire! Please head over to the gallery tab to see some pictures. 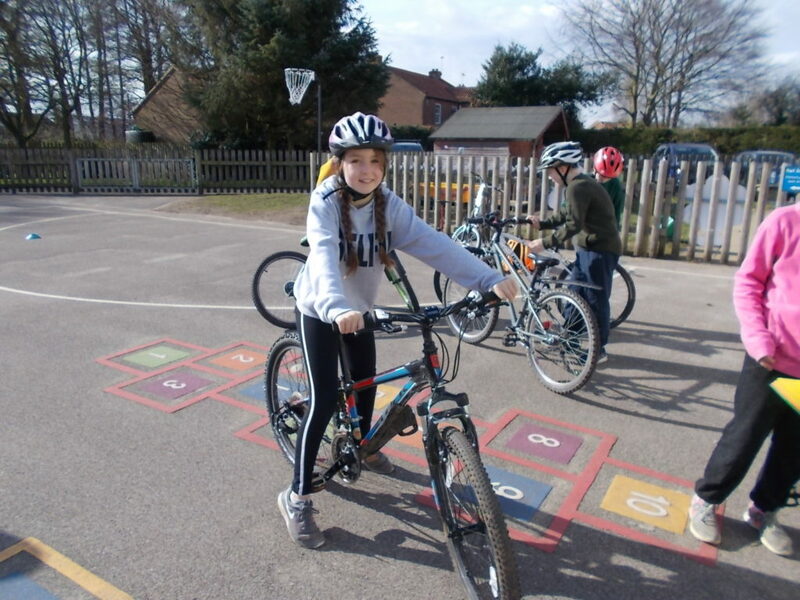 The Year 6’s were taking part in Bike Ability on Wednesday with Sue and Dave. They spent the morning learning how to check their bikes, and the basic safety of riding a bike and then in the afternoon they were out on the road. 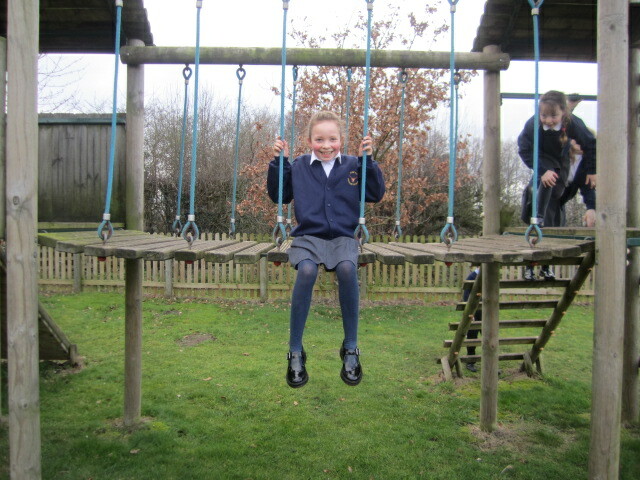 Both instructors were extremely pleased with all the children’s performances and how polite they were at all times. 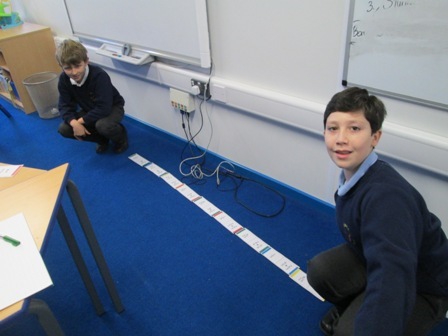 Well done Year 6, just to pass the test next week! 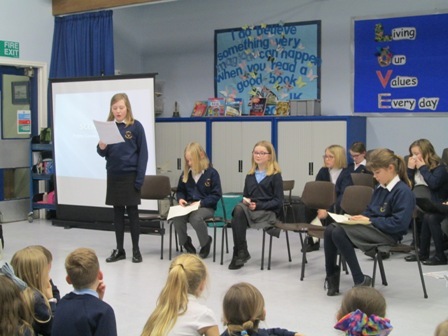 Whilst the Year 6’s were taking part in their Bike Ability, the Year 5’s were working on their drama skills performing their Kenning poems they had written the day before. We saw some wonderful acting. We were also locating Viking settlements using Google maps and atlases in geography, linking to our history topic. 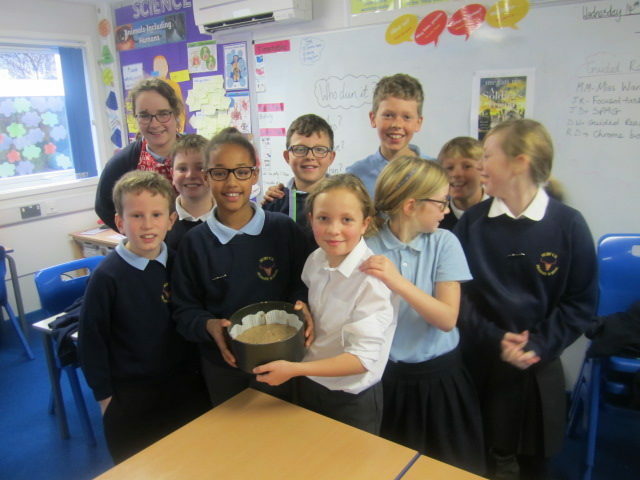 Thank you to Easingwold Outwood and to Mrs Duncan who came in to teach Science to Class 4 on Tuesday morning. 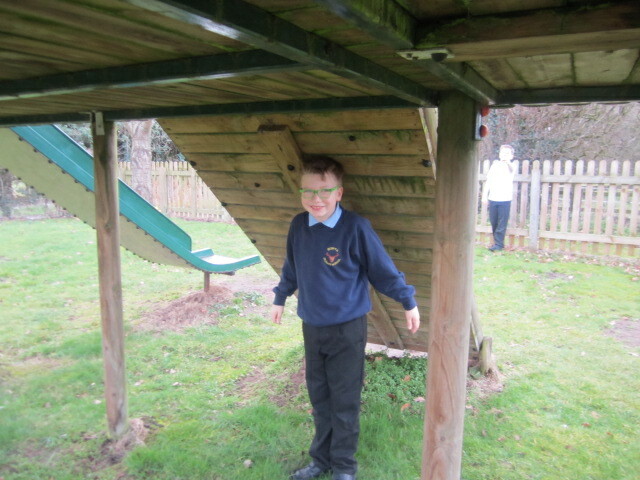 We all enjoyed learning the Science behind gravity. 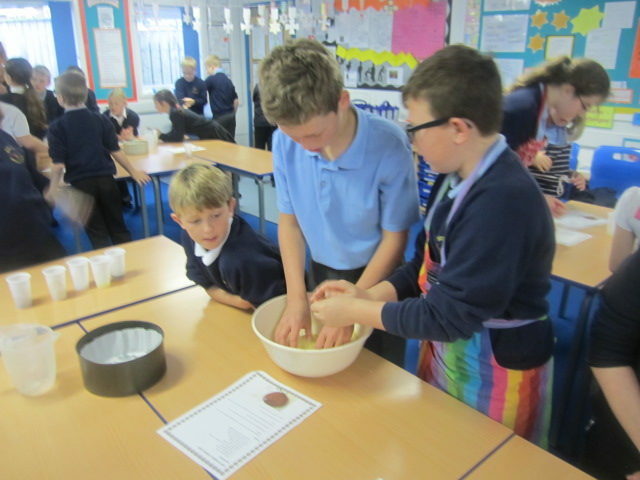 Class 4 have had a fantastic Science week. On Monday, they were set the task of building a desktop Viking catapult using equipment within the classroom. Throughout the week, they investigated what size lever was needed to fire the furthest distance, types of angles they could use and what missile would be the best. 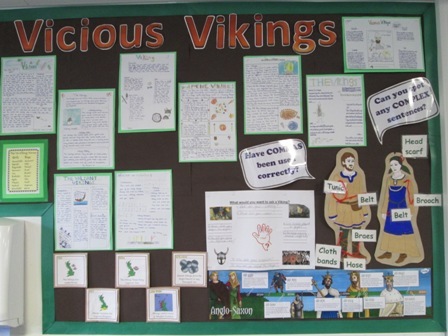 This Science focused topic linked to the whole curriculum; maths (angles and measuring), history and geography (Vikings), DT (making the catapults), English (persuasive writing). 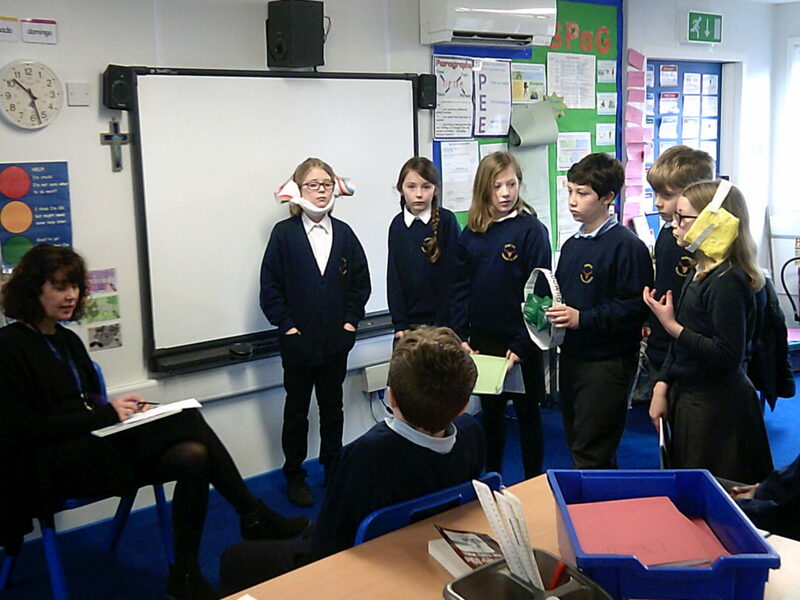 On Friday, Class 4 had a competition to see which catapult fired the missile the furthest…It was a close competition and all children had some brilliant ideas. Would Lego be the best material to use? 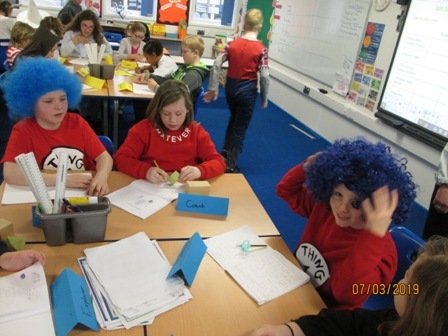 This week also saw us join in to raise money for Comic Relief, and what a superb contribution we made, not only as a class but as a whole school. 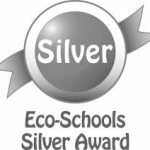 A huge well done to everyone. 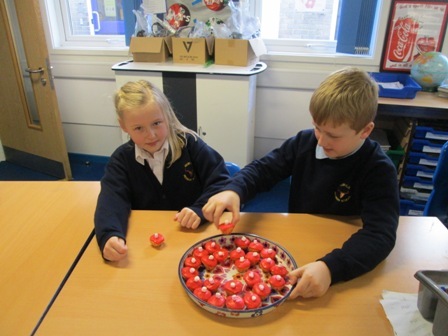 Class 4 particularly enjoyed making a giant Red Nose out of coins…and then counting all the money up afterwards. That was some excellent perseverance and maths work. Thank you Class 4! This week we have enjoyed another lesson of problems solving in our maths groups. Our focus for the week was properties of shape, and some of the questions proved quite a challenge. 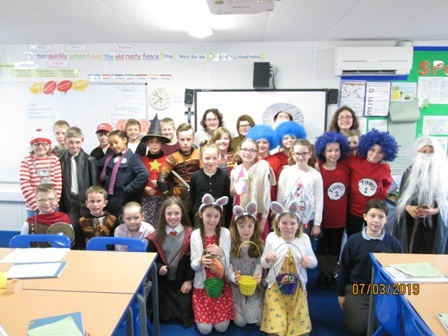 We all had a great day on Thursday for World Book Day. 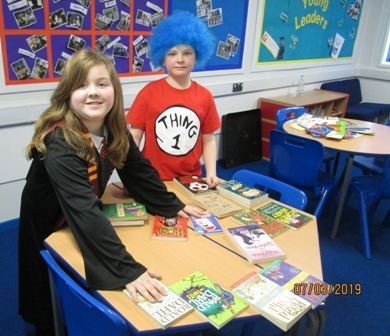 All of Class 4 dressed up as their favourite book character and at the end o the day the Year 5 children took charge of the whole school book swap. 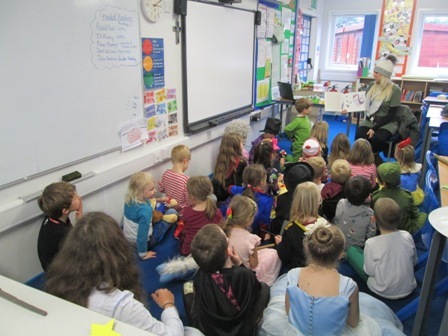 At the end o the day, each teacher chose their favourite book to read and children from all classes were allowed to listen to whichever story they wished. It was a lovely end to a great day! 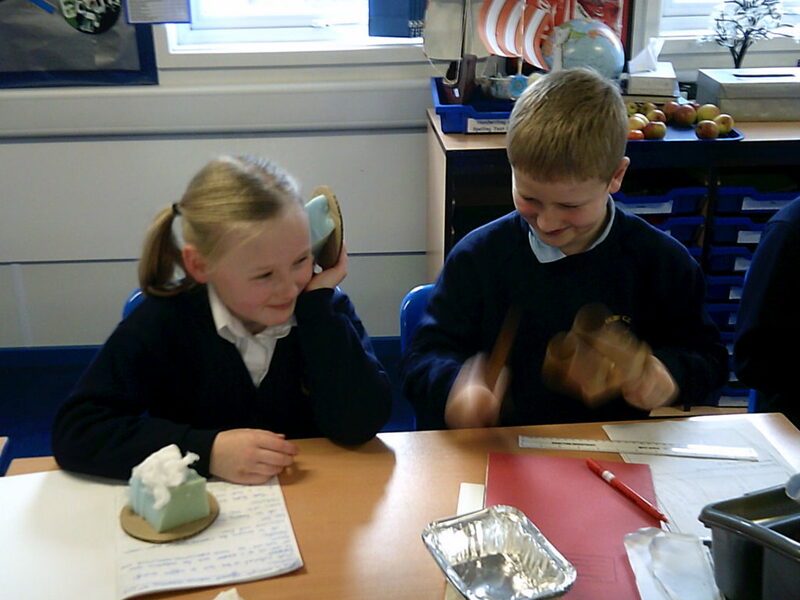 This week we have been finishing off our Science topic: Sound. 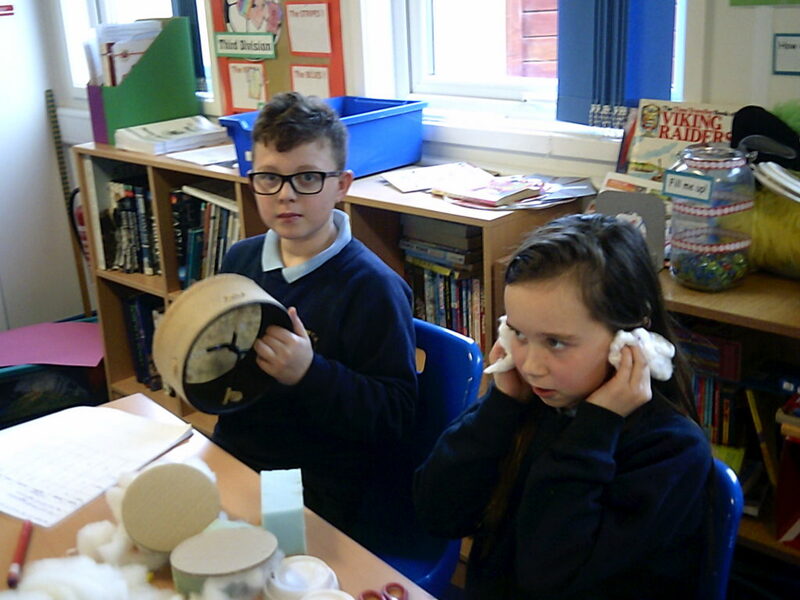 We have been investigating different materials which would reduce the sound to ensure we protect our ears at a music concert. 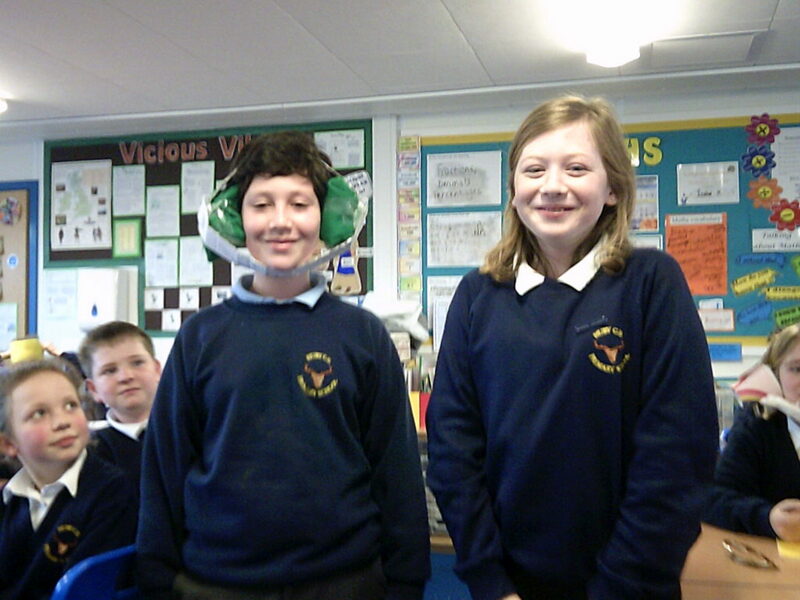 We even went up against the judges with our newly designed ear defenders. Take a look at some of our designs. 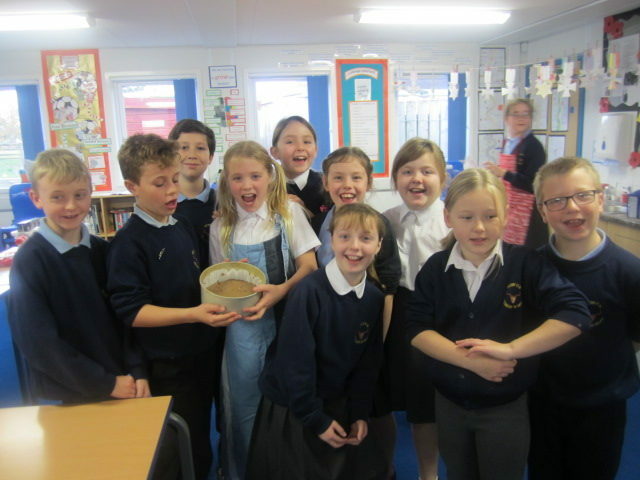 On Thursday our whole class went to Huby park, as we had gained all our Ready to Learn cards and our class marble jar was full. At the beginning of the year, we decided as a class what we wanted our treat to be once the jar was full. Class 4 have worked hard since September; behaviour wise and academic wise and truly deserved this treat. 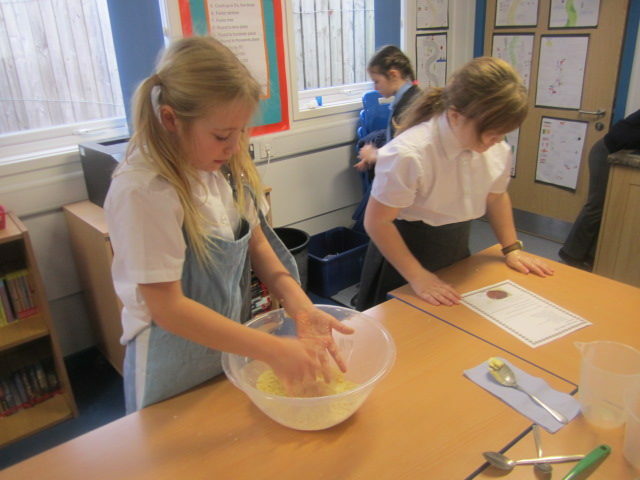 Mrs Webster even baked her famous flapjack for everybody and as usual it was delicious. Thank you Mrs Webster! 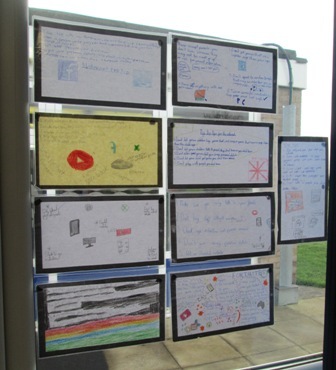 We have had a fairly quiet week in school with regards to visitors so we have been very busy in our classroom learning. Below you will see a variety of photos from the week and what we have been getting up to. 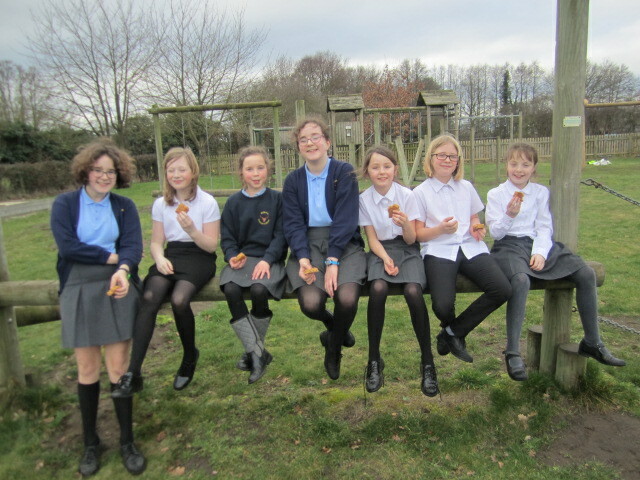 A big thank you to Mrs Webster for baking us all some very delicious Valentines cakes. A very nice treat on Thursday. 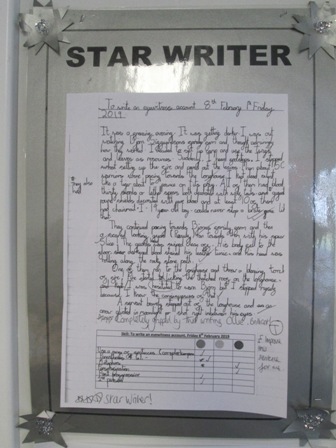 Well done to our Star Writer this week. Valentines cakes baked by Mrs Webster- Thank you! Our own science investigations learning about how sound travels. Was it a fair test? What variable did you change? 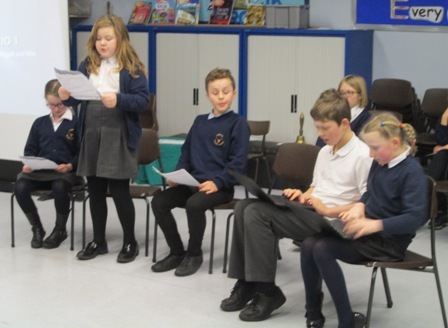 On Tuesday afternoon, Class 4 presented an E-safety talk to KS2 parents. 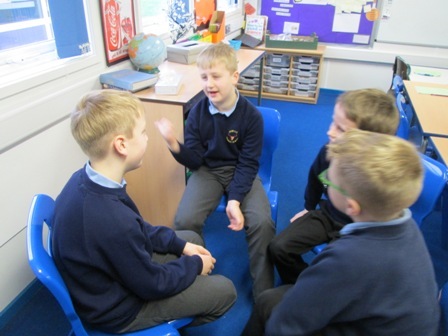 They discussed the dangers of the Internet, role played possible scenarios they could face and demonstrated to their parents what they have been learning. They did a fantastic job! Over the past few weeks in maths, we have been learning about fractions, decimals and percentages… We think we have greatly improved! 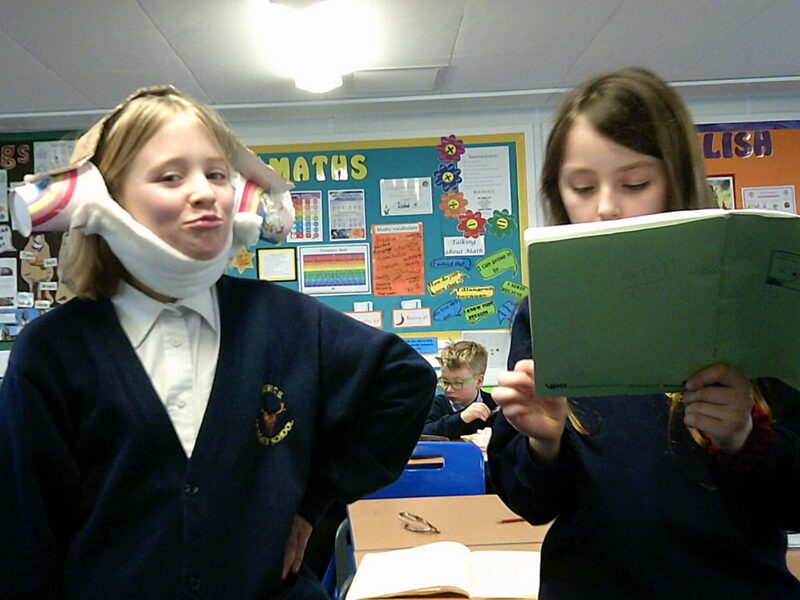 We have been using many different techniques to help us learn. Every week we enjoy our gymnastic lesson with Mrs Broadhurst. We have been working on our different balances, beam technique and our confidence. What do you think? Are we any good? 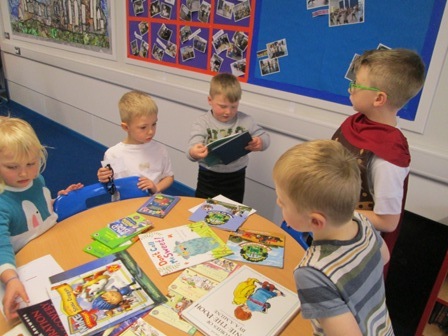 Class 4 are loving their new class read, ‘The Viking Boy’ by Tony Bradman and have been getting into the different characters. Here are a few photos from when they were ‘Hot Seated’. Do you feel nervous, angry or betrayed? 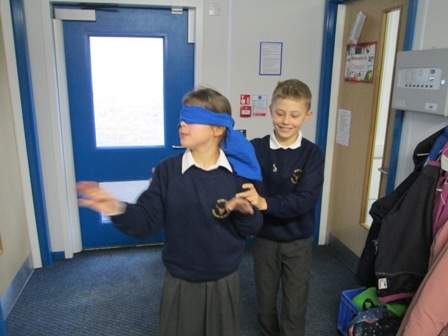 The Year 5’s are taking on new challenges each week within Young Leaders with Mrs Booth and this week their challenge was: The walk of trust. 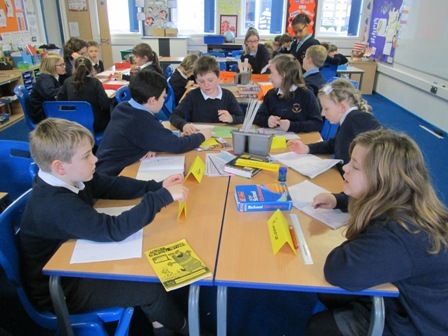 I wonder who was the most trustworthy Year 5! 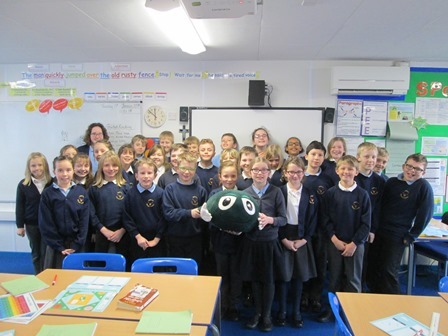 This week we had two people from the NSPCC come to speak to us about how to keep ourselves safe from different kinds of abuse. We learnt the childline number using actions (08001111) and talked about many different scenarios which were either right or wrong. 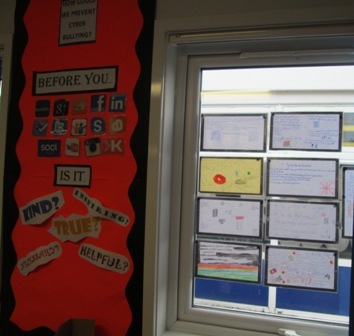 It was an interesting talk and helped us with our PSHE topic and E-safety topic. 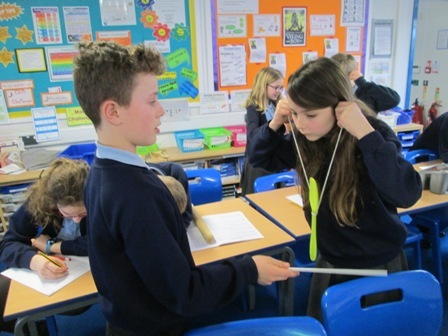 In Science, we are continuing to learn about sound and during the lesson we observed how sound waves travelled. 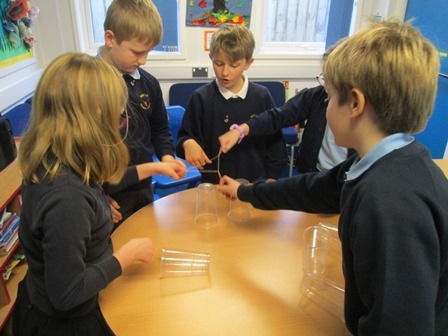 We did this through an experiment using a metal spoon, string and a plastic ruler. We will then continue this by looking further into this by changing a variable and discussing another line of enquiry. 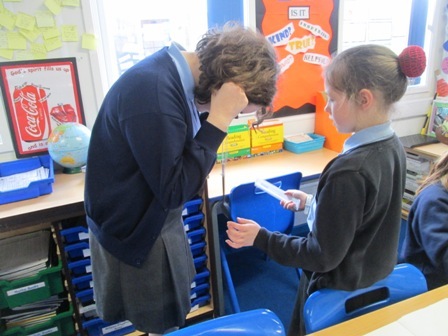 Year 6 child said ” Wow, how does the sound travel through the string?” Year 6 child 2: ” The string is known as a conductor.” Superb vocabulary and knowledge from the children during the lesson. 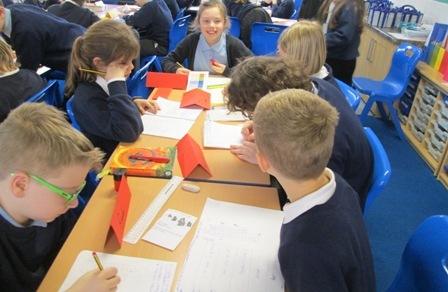 Take a look at what we have been doing recently; ordering fractions with different denominators, investigating what a vibration is and enjoying our first young leaders challenge with Mrs Booth. Well done Class 4!! Your chocolate logs looked and smelt amazing!! Enjoy sharing them with your family. Thank you to the whole of KS2 for a fantastic Christmas party! We are all very proud of you, and look forward to hearing about how much money you have raised for such a brilliant charity. Well done!! Well done KS2, you performed brilliantly!! You certainly know how to put on a good performance. 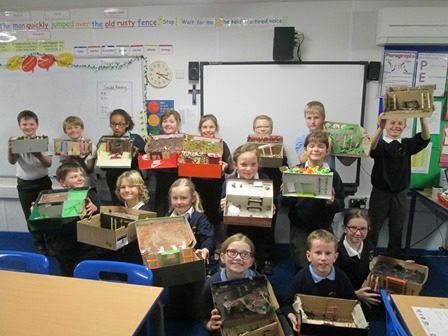 What do you think to our WW1 trenches? We designed our trenches taking ideas from the Internet, then we wrote our methods and then we had the best day making them! Take a look at our fabulous Trench Cake we chose to make as part of our ‘Ready to Learn’ and ‘Class treat’. 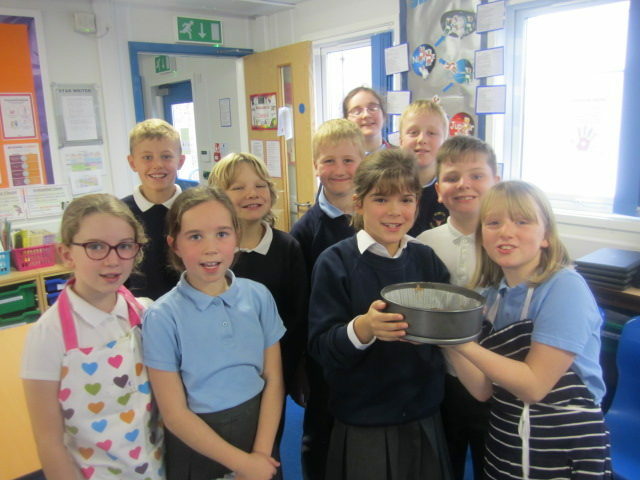 As part of our History topic ‘WW1’ we used our mathematical skills to weigh out the ingredients, and worked as part of a team to bake a trench cake. 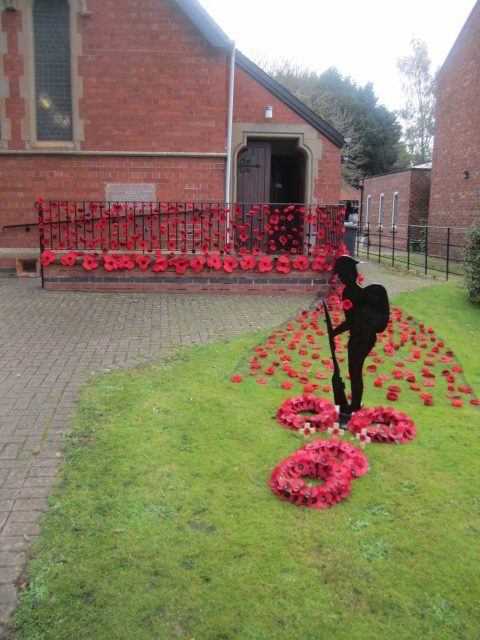 We took part in Huby’s memorial service on Friday 9th November to commemorate the fallen soldiers. 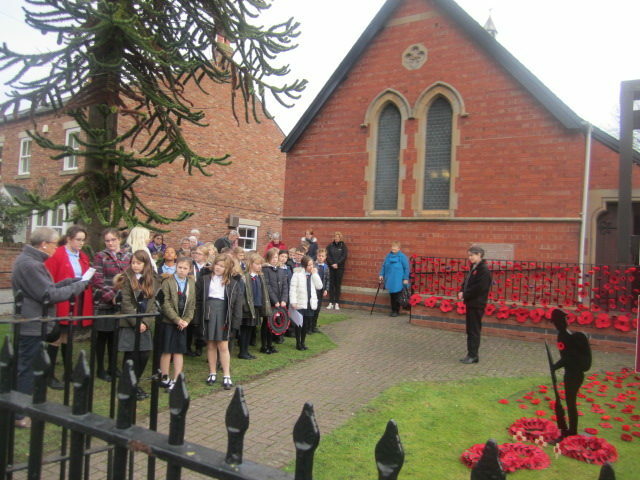 We read aloud the poem we had written, and remembered the lives which were lost. Below are pictures of our visit to Etz Synagogue in Leeds, where we learned about the Jewish faith. Our topic is World War 1 where we have been learning all about how the war began and what it was like to live during that time. 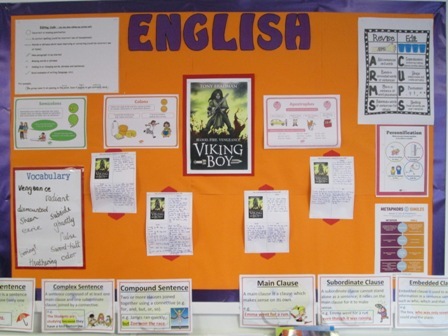 This term, our English topics are based around our history topic. Our most recent topic work was our fantastic newspaper article, reporting on a chosen key event. 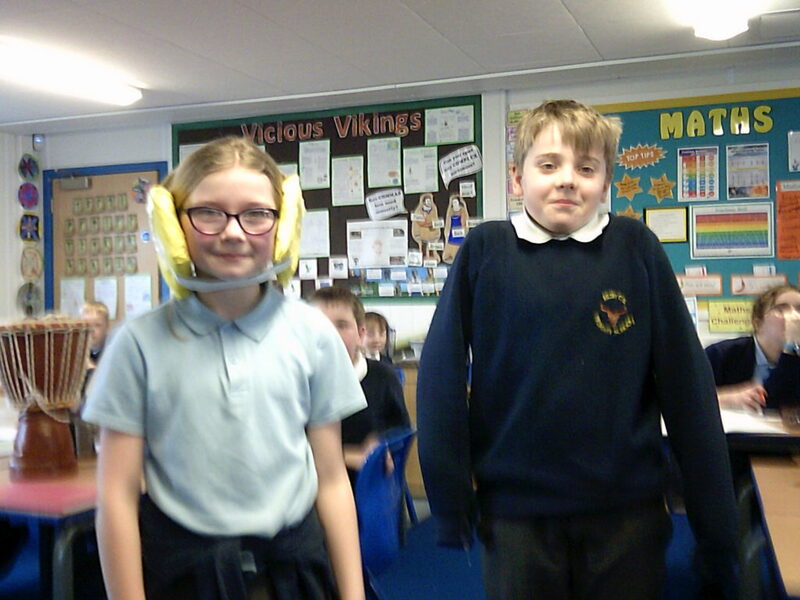 In Science, we have been looking at Animals including Humans and learning in detail how our bodies work. Take a look at our lesson, learning all about our blood and the elements it contains. The pupil’s then wrote a scientific observation, which were excellent. Our Maths focus has been on place value and the four operations throughout the first half term. Below the children are using concrete resources in maths to support our learning with negative numbers. 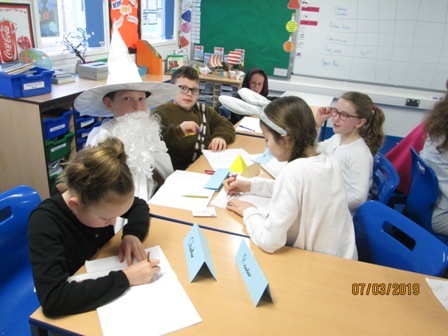 As always, autumn term gets very busy, especially with the run up to our phenomenal Christmas play which will be revealed later on in the term but please remember that regular reading and learning those times tables and division facts is a important part of learning. 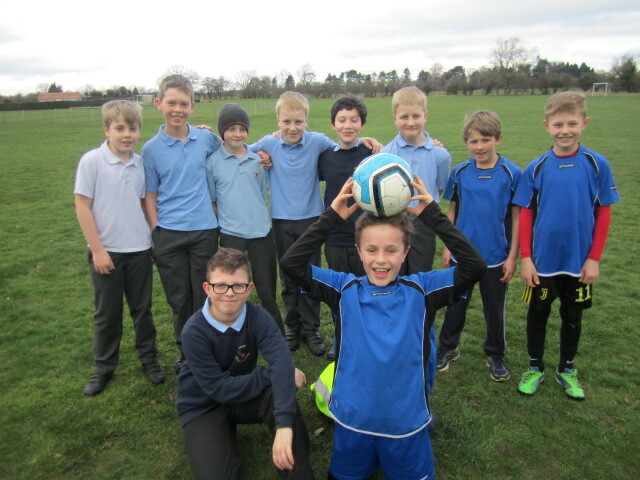 Our football and netball teams have been competing in our Cluster sporting events. Great sportsman ship, and some wonderful results! 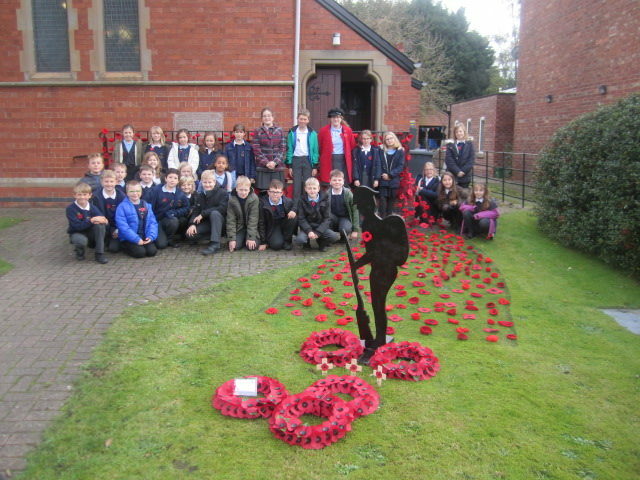 Well done Year 5 and 6. 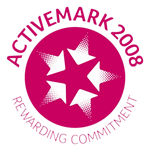 We’ve been having great fun learning our new sport ‘judo’ over the first half term, and are now moving on to kick boxing! After our PE questionnaire, we came to the conclusion that children wanted to learn a new sport, and this is a sport which only very few people learn outside of school. Each week, all pupils at Huby look forward to their Martial Arts lesson. The two pictures below show children practising their grappling techniques! We had a great morning at Crucial Crew, RAF Leeming- Something that we all found out was, that a child as young as 10 years old could be arrested! 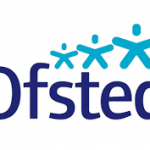 Our class page will be updated regularly throughout the term with useful websites and ways to help your child at home, so please check this page regularly. A great website with lots of games looking at all the spelling patterns. A fantastic website covering all topics of the curriculum with quizzes for each one- try and test yourself! 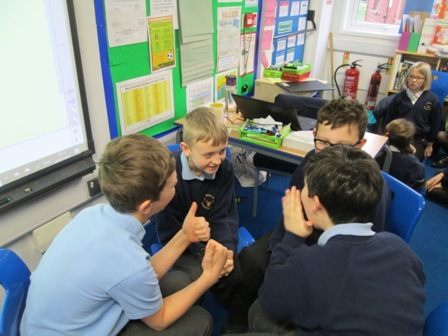 A range of interactive Maths games on each topic of the curriculum. Try beating your own score on the multiplication/division facts game! A website we have used in our revision sessions to practise speed reading. Helpful tool which breaks down sentences into their word classes. A range of resources based on spelling and grammar.